The history of the United Church of Christ, Congregational, is rooted in the history of Medina Congregational worship services began in 1817 in a log cabin on what is now Huffman Road with the Episcopalians shortly after the first settlers arrived in Medina Township. The congregation was established by Reverend William Hansford with 7 members in 1819 and they worshiped in the cabin of Isaac Barns which was located about 3 miles northeast of the present city in the Weymouth area. When the village of Medina was laid out in its present location a few years later, the congregation purchased its present site on the corner of Liberty and Broadway at the northeast corner of the square. The location on the square was important to the early Congregationalists, so a brick church was built in 1833 opposite the present church location on North Broadway. A cupula was added in 1837 to the church. The old brick and stone church, horse barns and a ailanthus tree that stunk like a rotten mackerel for ½ century was razed by contractors Frances and John Hill in 1880. 1. The present brick sanctuary was designed by Architect B. J. Bartlett and built by Hoyt and Hiram Goodwin. 2. Horse sheds were replaced with a $15,000 church and completed, debt free and dedicated on May 4, 1882. 3. During the construction period in 1880 to 1882 the congregation held services in the Phoenix Hall. 1. In 1896 the sanctuary was wired for electrical lights. 1. The east wing of the church edifice was built adding to the auditorium and Sunday School space and doubling the dining room and kitchen capacity. 2. A parsonage was built on grounds owned by the church just to the east in 1907. 1. In 1917, the State Fire Marshall says all sheds on the church property must be removed. 2. In 1924, a tree blew down dropping a ton of stone and brick on the organ corner of the church, but the roof held preventing interior damage. 1. The old horse barn was razed on Congregational Church grounds and Albert F. Bartholomay will build a real garage in 1927. 2. An electrically lighted bulletin board was added in the front yard of church, a long-cherished desire of the church membership in 1928. 1. During his pastorate the sanctuary again underwent extensive alterations. The choir loft was moved from the rear of the chancel and the pulpit was moved away from the center of the dais to the choir loft and from there to its present location. 1. In 1954, a large addition to the church sanctuary was built for $136,500. 2. The Christian Education Building was completed at a cost of $65,000 at the north end of the church in 1957. 1. In 1961, the Congregational-Christian Churches merged with the Evangelical and Reformed Churches to form the United Church of Christ. The congregation soon changed its name from First Congregational to United Church of Christ, Congregational to recognize the new union. 2. Work is done frequently to maintain the beauty of our church facilities, including interior redecorating and renovation and exterior sandblasting and repointing in 1960. 3. The church membership in the year 1965 was 992. 1. The church was extensively remodeled in 1972, when the Chapel was added. 2. The popular Hobby Horse Preschool is owned and operated as a ministry of the church. 4. In 1973, the 1903 cornerstone was replaced and Mr. Baker placed a time capsule from 1973 in the opposite comer. This spurred many more renovations to the church and this began a more modem setting. The church has withstood many years of existence because of the great remodeling program. 1. Additions were made to the organ in 1984. 1. In 1989, an organ committee was formed to study and solve deterioration of the pipe organ. 2. A Capital Fund Drive was initiated to rebuild the organ, repair stained glass windows and install an elevator. 3. In 1991, Rebuilding of the organ began. The total project cost was around $140,000. The tower room was repaired and tower walls were re-plastered. 4. In 1992, A new elevator was installed. 5. In 1994, Exterior brick work was tuck-pointed and waterproofed. A new roof was added on the sanctuary and the Chapel. The Organ rebuilding project was completed. 6. In 1995, Exterior trim was painted. 7. In 1996, the sanctuary underwent more alterations, including the widening of the altar steps, repair of the ceiling and painting throughout. The rose window was installed. 1. In January, 2000 the parsonage/manse that stood at 219 E. Liberty St. was razed. 2. In 2003, First Christian Church shared our facility while their new church was being built. 3. In 2004, the stained glass windows on the west side of the church were repaired. 4. In 2005, the congregation purchased Hobby Horse Preschool. The organ was repaired and cleaned and a lining was added to the organ chamber walls. 5. In 2006, an architectural firm was hired to assess our building and facilities. Stained glass windows were completed in the south wall of the sanctuary. Surrounding drywall was repaired. Church offices were improved and decorated. A security system was installed. 1. In 2007, substantial repairs made to the building’s foundation, exterior walls and drainage system. The East Room roof was repaired and the East Room stained glass windows were restored. The parking lot was replaced; sidewalks leveled, interior and exterior lighting was improved. New cabinets and countertops were installed in the Community Room. A security door was added between Hobby Horse and the east basement hallway. 1. On May 17, 2015 UCC Medina broke ground for a new welcoming and accessible entrance. 2. On September 11, 2016 a Ribbon Cutting Ceremony was held to celebrate the completion of the new entrance, library, ADA restrooms, elevator, offices, living water fountain and stairway. In 1907, during the pastorate of Reverend Jesse Hill, the parsonage or manse was built on a lot just east of the church on East Liberty Street. A parsonage house is a house next to the church where the pastor lives. It is just almost as important as the church itself. The United Church of Christ, one of Medina's first churches, actually had a parsonage house right next to the church. The 93 year old parsonage house was originally built as a parish, making the century old home a religious icon, as well as a historical icon in Medina. Therefore, it's not surprising that the city turned down the plans for demolition. However, all other options to save the home were too expensive and the owner was forced to tear the house down, even though many of Medina's citizens wanted to save this piece of Medina's great history. All in all, In January of 2000 the 93 year old parsonage house became another victim to change and growth to modem day Medina. The loss of the parsonage house was not only a huge loss to Medina's community; it was also a great loss to the United Church of Christ, and all of its members. 1. Lathrop Seymour of Weymouth was the first Sheriff, serving from 1818 to 1824. Tom Miller is Sheriff in 2018. 225 East Liberty Street building converted to professional offices in 1952. 1. 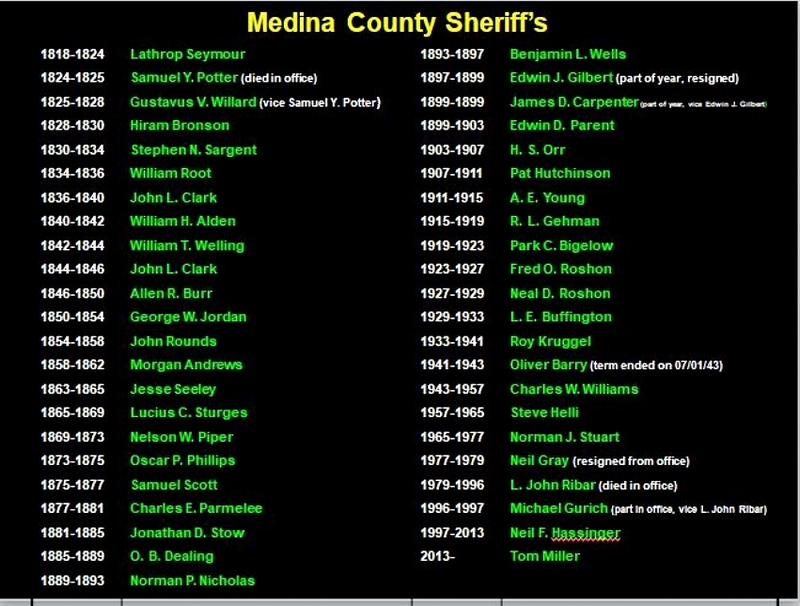 Property sold to the Medina County Commissioners in 1954 by the Strong estate. 1. Property sold to the Medina County Commissioners in 1985 by Ziegler estate. 1. Property sold to the Medina County Commissioners in 1972 by H. C. Clark. 2. H. C. Clark house raised for a public parking lot in 1972. 2. Dr. Kornfeld house raised for a public parking lot in 1972..
1. The Old Towne Cemetery is located on East Liberty Street and was given to Medina by Elijah Boardman in 1818, but not deeded until 1836 and is the resting place of Medina's earliest settlers. 2. First burial in Old Towne Cemetery was old settler, Harmon Munson in 1829. It is no longer used for burials. 3 Old Towne Cemetery is not associated with either the Congregation or Episcopal Churches. 5. Two rectors of St. Paul’s Parish are buried in Old Town Cemetery; William Granville, third rector, who served from March 1836 to May 1844 and Anson Clark, seventh rector who served from the summer of 1869 to the spring of 1872. 6. A 200 foot iron fence was installed at the Old Towne Cemetery in 1879 at a cost of $1.50 per foot. 1. The first preacher in Medina Township was an Episcopal priest, Roger Searle, who arrived from Connecticut in 1817; his first recorded sermon in the township was preached at the house of Zenas Hamilton on 11 March of that year. Before long, Searle organized a parish dedicated to St. Paul, and the first church building was constructed on 10 April. Because of the scarcity of resources, this building was used for a time as a union church by both the Episcopalians and the Congregationalists. As Medina increased in population, the place of worship was moved there from its original remote location. 2. The first site chosen for the church edifice was on a trail between what is now Weymouth and Medina. The structure was fifteen by twenty feet and was thatched with clods of clay and dry grass. It was used as both a church and as a school, with Miss Eliza Northrop as the first teacher. 3. On March 22, 1818, the Reverend Mr. Searle celebrated Holy Communion for the first time in the history of the county, at the home of Mr. Isaac Barnes near Weymouth. 4. In the year 1818, just one year after it had been built, this first church burned down. It was replaced by a similar but larger structure nearer the center of Medina Township, in which it was arranged that the Episcopalians worshipped on Sunday mornings and the Congregationalists in the afternoons. 5. In 1819, the Reverend Mr. Searle was made rector of the church. In 1820, twenty-four adults signed a petition for the incorporation of St. Paul's Parish in accordance with the Act of Congress passed on February 5, 1819. 6. The first choir at St. Paul’s Parish was formed in 1820 when it was comprised of six men, selected by the vestry. Women were not allowed to serve in any church capacity for another fifty years. 7. In 1826, it was decided by the vestry that services would be held in the school house, and for a year or two lay readers con- ducted the services. The Reverend Mr. C. P. Bronson sent prayer books and hymnals to the parish. 1. In 1830, the Reverend Mr. Alvah Sanford assumed charge of the church. After 1832, all the parish meetings and church services were held in the Village of Medina. 2. In the early days, slips (pews) in most churches were offered by subscription. . The First Congregational Society in Weymouth, served by St. Paul's ministers for many years, sold pews up until.1883. A few pews were set aside for the elderly and the remainder was sold. They cost about $50, depending upon location, not because they were closer to the pulpit, but closer to the stove. 1. Reverend Mr. Sanford resigned and the Reverend Mr. William Granville, from Plymouth, England, became the next rector on March 7, 1835. He was the first resident rector. 2. In 1835, Miss Cornelia Boardman gave the land for the present site of the church, and by April, 1836, the new church was completed in Medina on this land. 3. The style of this white frame structure was of conventional New England design and rather plain. The new church structure was dedicated on July 11, 1837 by Bishop McIlvaine. 4. Because no heat was provided, the members had to bring their own charcoal heaters. 5. The Reverend Mr. Granville resigned after eight years as rector in May, 1844. The Reverend Mr. George S. Davis became the next rector in 1845. 1. The Reverend Mr. Edward Kennedy succeeded him as the next rector in February, 1856, but the Reverend Mr. Davis returned to the parish in 1857. 1. By 1859, St. Paul's congregation was clamoring for free pews. At their annual meeting on May 19, the Trustees voted that "the sittings of that church should be free for the coming year." The Gazette noted that "No one needs stay away from hearing the Gospel preached now." Selling seats was a common fundraising practice, and you often had to buy your seat again when funds were low. 2. 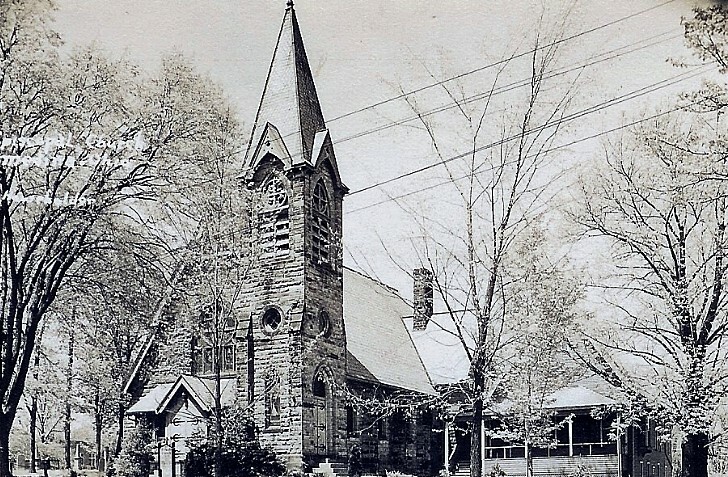 The “Semi-Centennial” Celebration of the founding of St. Paul’s Parish was held on April 10, 1867 commemorating the erection of the first church built in Medina Township on April 10, 1817. 3. George S. Davis served the parish for a total of twenty-two years, giving his resignation to the vestry on April 6, 1869. 1. Anson Clark came to Medina with his parents from Conn. in 1818 and became one of the first from the St. Paul’s Episcopal Church parish to enter the ministry. 2. With his wife and family, he went to Gambier, Ohio around 1831 to study divinity at Kenyon College. Upon graduation, he served in many churches in Ohio, including one in Elyria. 3. He returned to Medina in 1870 after retiring. He was then persuaded to take charge of St. Paul’s until a new rector could be found. He died March 11, 1878 and was buried near the church. 4. In 1869, renovation and repairs were made to the church building, and a new organ was purchased for $350. In 1869 the Reverend Mr. Anson Clark became rector, but he stayed for only two years. 1. In 1872, $1,000 was raised to obtain a new rector. The vestry chose Wilfred Dean. Reverend Mr. Dean was judged to be a good preacher and a kind man, but he was forced to resign on November 21, 1875, because of failing health. 1. The Reverend Mr. Thomas Martin of Pittsburgh was called as rector on March 20, 1870. At this same time Mr. Charles Booth gave his house as a rectory for $124.00 a year. The Reverend Mr. Martin resigned on June 26, 1876. 1. The congregation "seriously started agitating for a new meeting house" in 1880, perhaps because the Congregationalists were erecting a new building. By 1883, they had raised $7,000 toward the new building, but hoped to get $2,000 more to build it in stone. 2. Hiram Bronson, a prominent local businessman, provided the extra funding for Grafton stone, selected and laid by local builder Paul C Parker. 3. Gordon W. Lloyd, a prominent church architect from Detroit, was selected as the architect. David Robertson was paid $ 11,000 to build it. 4. The walls are sandstone, built on a stone foundation and covered with a slate roof. Its floor plan is reminiscent of many other Anglican churches, with the typical tower atop the narthex and the rectangular nave. In a similar manner, the building is constructed in the shape of a cross, due to the construction of transepts connected to the chancel. 5. New pews and a new organ were purchased for the new church. An antique baptismal fount was given to the congregation by the Church of England. The building cost a little over $11,000, including windows and other gifts. The completed structure with furnishings cost a little over $16,000. 6. 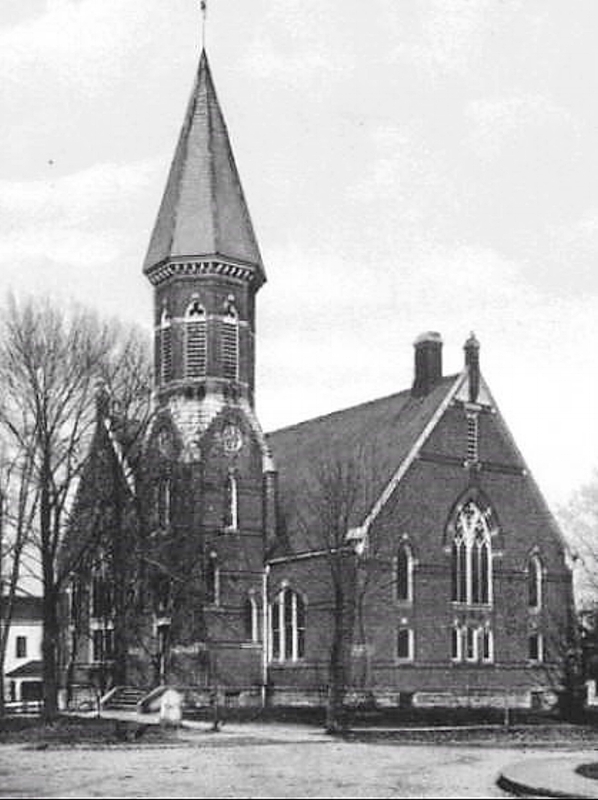 The first service was held in the new church on Friday, December 19, 1884. 7. This structure still provides the main sanctuary of the present St. Paul's Church. In this church there are various types of memorials. One is the large stained glass window in the front which was given by the St. Paul's Ladies Guild. The church services were carried on by visiting clergy after the Reverend Mr. Collogue left on September 1, 1885. 8. This building comprises the worship space and houses our historic Johnson pipe organ originally built and installed in the 1920s. This building has been partially remodeled four times. 9. Eleven stained glass windows were donated by members of the congregation at a cost of $2,300. Hiram Bronson's beautiful window over the altar cost $800 and depicts St. Paul preaching on Mars Hill. 10. The old wooden church building of 1835 was sold to Abner Bishop for $225 to be used as part of his carriage works on North Court at Friendship. 12. In 1925, the lumber from this old church was used for cottages at Chippewa Lake, but some of it was recovered and made into commemorative crosses. 13. The church services were carried on by visiting clergy after the Reverend Mr. Collogue left on September 1, 1885. 1. The Reverend Mr. Elsworth Cornwall of New York State began his duties as rector in January. 1886. He resigned on June 1, 1888. 1. The Reverend Mr. Rolo Dyer came from the parish at Dennison, Ohio, in May of 1888. He resigned in 1891. 1. In 1891, upon the recommendation of Bishop Bedell, the Reverend Mr. Carrol E. Harding became rector. He resigned on March , 1893. 1. In August of 1893, the Reverend Mr. William J. Hawthorne became rector. He resigned on March 3, 1897. 1. The Reverend Edward Livingston Kemp became rector on May 1, 1897. During this same year a new parish house was also completed. 2. On December 20, 1900, the Reverend Mr. Livingston Kemp was transferred to the Diocese of Maryland. 1. In 1902, ninety-one families were connected with the parish. There were 86 Sunday school members and 291 baptized members. In the prior twelve months there had been seven baptisms, nineteen confirmations, five marriages, six burials, and a total of 120 services. 2. In May, 1902, the congregation voted unanimously to build a Parish Hall. 3. Built in 1903, the Parish House was originally a one-story structure with a basement and attic. It was originally built to provide Sunday school and social space for the congregation. 4. In 1904, Ladies of St. Paul’s Parish contributed to the cost of the bathroom and electrical lights that were added to the parsonage, replacing the outhouse and oil lamps. 1. On November 1, 1904, the Reverend John S. Lightbourn came to Medina from Georgia. Finding the climate in Ohio injurious to his health, he resigned as rector on November 27, 1906. 1. On January 27, 1907, the Reverend Mr. Henry D. Stouffer was called to the rector ship of St. Paul’s; He later became a Y.M.C.A. secretary, The Reverend Mr. Stouffer resigned because of poor health on August 1, 1913. 1. The reredos or alter screen along the back of the altar was made in Chicago of pine stained dark oak. Dedicated in 1916 by Bishop Du-Moulin it was given in honor of Mrs. Samuel G. Brainard. 1. On April 8, 1918, the Reverend Mr. Russell K. Caulk became rector. 2. In December 1919, Frank O. Hobart was hired as the new choir director at St Paul's, in addition to being the organist. He was a self-taught organist who had been a member of St Paul's choir since he was a child. 3. In 1922, twelve feet was added on to the St. Paul’s Parish house and a second floor addition was completed at a cost of $5,000. 4. In 1926, the Reverend Mr. Caulk resigned from the parish rector-ship. 1. In 1927, Rector Quinton founded the Chippewa Yacht Club and served as its first commodore. He built the first Y-flyer in the basement of St. Paul’s Parish house. 2. In 1928, Frank Hobart’s Aunt Frances Hobart, a former organist paid to have the 1885 organ refurbished and electrified. 3. In 1936, the silver chalice was stolen from the sacristy and was never recovered. 4. The Anniversary Day and Builders Day were celebrated in 1937 by a reenactment of the first church service conducted by the Reverend Mr. Searle. 5. 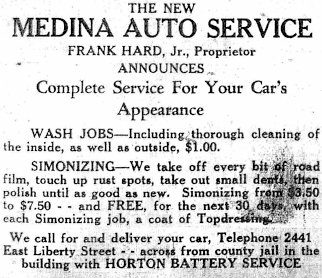 The congregation also held a mortgage burning ceremony on December 19, 1937. 1. The Reverend Mr. Samuel Hardy became the next rector. During his rector-ship the carillon bells were installed. 2. In 1948, various outside organizations started to meet in the church. These included a kindergarten and a class in ballet. 3. In 1954, the Reverend Mr. Hardy died while teaching a confirmation class. He was the twenty-fourth rector of the church. 4. Organist Frank Hobart played the new carillon in 1946. It had 25 bells and was "a memorial to St Paul's boys and girls who served in World War II". Hobart played a 15-minute concert every day at 5 pm. In June 1946, he retired after 45 years as organist, the last 27 also as choir director. 5. In 1953, the congregation agreed to build six Sunday school rooms under the main structure of the church. Much of the work was done by members of the congregation, so the cost was kept within the budget of $10,500. 6. 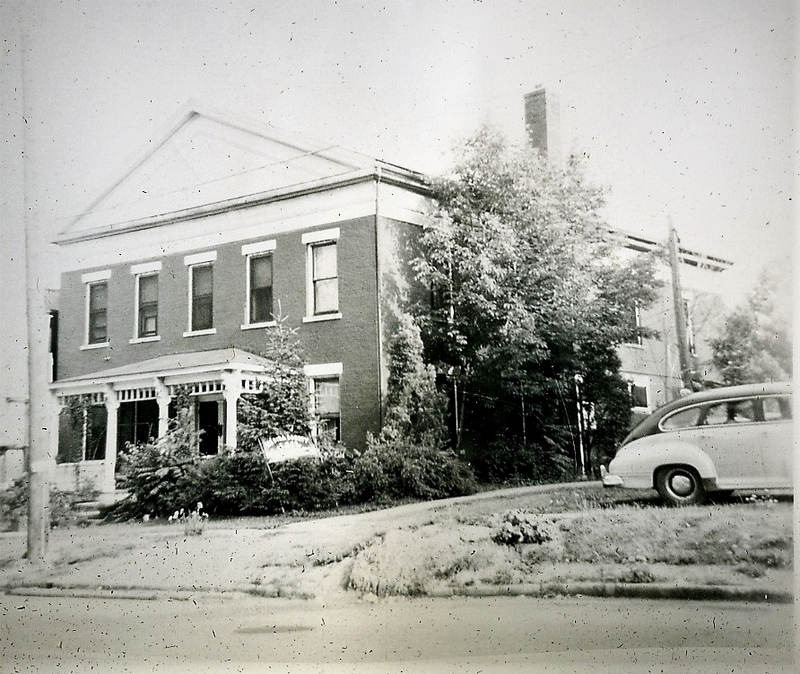 In 1953, Medina County’s newly-formed Society for Handicapped Children met in the Sunday school rooms during the week until 1956, when the school known as St. Nicholas School moved to the two-room Weymouth School. 1. In February, 1955, the Reverend Mr. Robert Reddish became the rector. 2. Canterbury House was built in 1959 on a lot originally occupied by a rectory. It was then connected to the Parish House and the Church Building by a carriage way over the church driveway. This carriage way joined the new exterior entrance to the ground level of the Parish House and the east side entryway of the Church Building. 3. Canterbury House contains the meeting rooms for the middle school and high school youth groups, offices for the Rector, Director of Religious Education, Music Director, Parish Manager, and Treasurer, and the parish library or “Common Room”. The Common Room is dedicated to a former rector, the Rev. Tom Ashton, and his wife who was killed in an automobile accident in 1960, Frank Hobart was back at the job, still playing the original 1885 organ. He finally stepped down in 1962 after 50 years on the job. 4. In June, 1961, the Reverend Mr. Reddish for personal reasons gave up the ministry to write. He later moved to Colorado. 1. In the early 1960s the Parish House was connected to the church building. In that remodeling, the topography of the parish’s lot was changed and the basement exposed; it thus became the first or ground-level floor and was provided with an exterior entrance. 2. The upper floor of the Parish House is a single space used as a parish hall. Sunday morning coffee hours are held here, as are a variety of meetings and activities throughout the week. This space is equipped with a coffee bar. 3. The lower floor comprises a kitchen and dining room which can accommodate approximately 65 persons for sit-down meals. 1. Father Bornfield excelled as a curate, while guiding St. Paul’s Christian Education for Children and pastoral visitation duties during his short term here. 1. May 26, 1974; The community was shocked and sadden as it learned of the deaths of the Reverend Father Thomas R. Ashton and his wife, Betsy, from an automobile accident. Minister of St. Paul’s Episcopal Church for the past three years, Father Ashton served in World War II and the Korean conflict attaining the rank of Lt. J. G. He worked in the sales field before deciding to enter the ministry. 1. In 1979, St. Paul's Parish Choir affiliated with the Royal School of Church Music (RSCM). Attendance was required at three music seminars addressing hymnody (hymn writing and singing), service music and anthems. The 1979 choir set and met a goal of fifteen choir members taking part. 1. In 1982, St. Paul's Church was listed on the National Register of Historic Places. 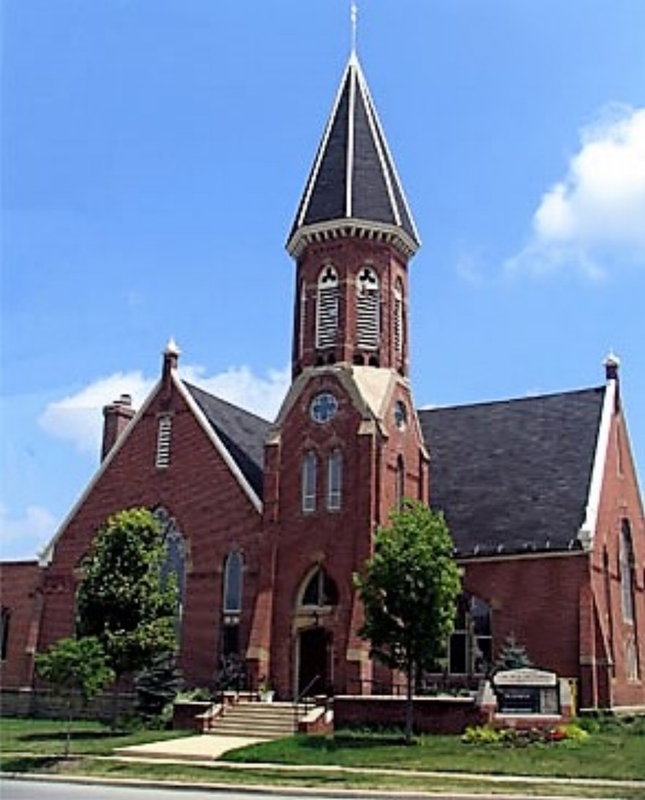 One of ten Medina locations on the Register, it qualified because of its historically significant architecture, as it is Medina County's best Gothic Revival church building. 2. Gwen and Bill Eagelson sponsored campouts for area Boy Scouts, beginning in 1984. Up to sixty young people visited their farm every fall, sleeping in 22 tents and enjoying fishing, hiking, and working on their merit badges. The campouts became an annual event and were held until at least 1999. That year, church member Pete Radamacher visited and lit his Olympic torch for the boys. 3. In 1989, the chancel (altar area) of the worship space was remodeled to conform to changing liturgical norms and the introduction of free-standing altars into Episcopal worship. 1. During his tenure, Father Bergmann was responsible for overseeing major repairs and renovation to the 1959 Canterbury House and church overall, while improving the financial condition of St. Paul’s Church. 1. In 2008, the chancel was again remodeled to improve flexibility of the space which would allow the church building to be used as a concert and performance venue. The chancel floor was leveled. Carpeting was removed and replace with hardwood flooring. 2. The organ console was moved, and all furnishings were replaced with easily removed or reconfigured furniture. 3. The nave (congregational seating area) of the church building seats approximately 165 persons in pews made of Southern Yellow Pine. These pews date from the 1920s. 4. Today St. Paul's remains an active part of the Summit Mission Area of the Diocese of Ohio.